Aloha! Diese Ein-Bett, ein Bad-Hütte befindet sich nur 100 Meter vom schönen, tropisch, blau, Meeresstrand entfernt. Wenn Sie ein Taucher sind oder einfach nur Schnorcheln, wird dieses Haus sicher Ihre Bedürfnisse zu erfüllen nur einen Block vom Sharks Cove ist, das die besten Tauch- und Schnorchel überall auf der Insel bietet. Dieses nette Ferienhaus befindet sich in einem üppigen, tropischen Umgebung gesäumt von duftenden, plumeria Bäumen. Es ist eine Minute von Foodland und The Coffee Bean für bequemes Einkaufen & Gourmet-Kaffee liegt. Wenn man aus der Tür zum Radweg für Morgen Spaziergänge oder eine Radtour auf einem tropischen Grün, Gartenweg. Sie werden in diesem Haus nicht enttäuscht sein, eine neue Küche und Bad. Es ist schwer, diesen Ort zu schlagen, die mit den weltbesten Surf, Schnorcheln, Tauchen, und schönen Stränden umgeben ist. Waimea Bay, Bonzi Pipeline, Haleiwa, und Sunset Beach, nur wenige Minuten entfernt. Das gemütliche Ferienhaus garantiert Ihnen finden "Spirit of Aloha". This VRBO delivers as promised. Clean comfortable and supportive owners our family loved its super convienent to everything. My wife and I stayed at the cottage while in Oahu for a friend's wedding, and we couldn't be happier with our choice. The cottage itself is cozy, nicely decorated, and well appointed. Although we did most of our eating out, the kitchen had everything you would need to cook at home, and the local Foodland grocery store is right down the street. The cottage has plenty of private space in the fenced yard for picnicking, sunbathing, grilling, etc. A short walk of maybe a few hundred feet puts you on the south end of the famous Banzai Pipeline, and the breaking waves were spectacular to watch as I did my morning walk along the strand. 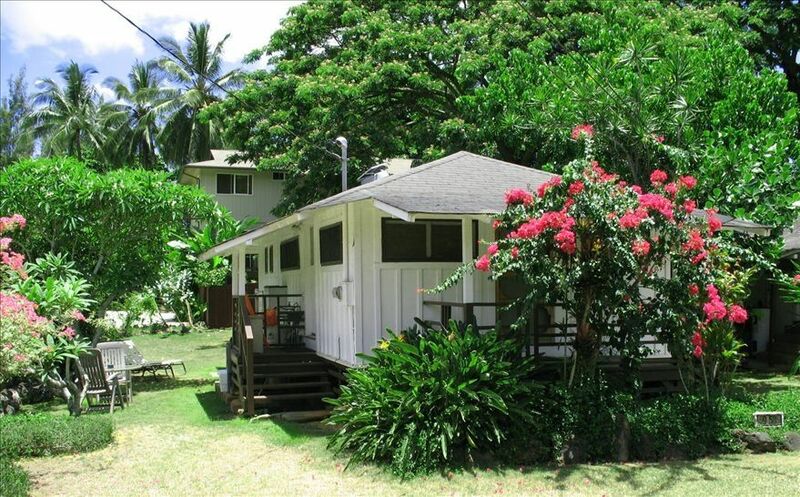 We found the Ke Iki cottage to be a great location for exploring the North Shore, whether it's shopping at Haleiwa, turtle-watching at Laniakea Beach, hiking to the Ehukai pillbox lookout, catching the sunset at Turtle Bay, or eating at Ted's Bakery or one of the many shrimp trucks (Giovanni's is amazing!). Donna and Darryl responded quickly to our questions and gave us a bunch of great recommendations for things to do (and to avoid) in the area. Unlike many nearby rental properties, the cottage has a wall air conditioning unit, which made sleeping much more comfortable for the less heat-tolerant among us. The parking spot had plenty of room for our rental SUV. Overall we had a fantastic time during our stay in Oahu, and the Ke Iki cottage really felt like our home away from home. Mahalo, Donna and Darryl! Great location-classic North Shore cottage. Really enjoyed our stay. Cottage is central to everything on the North Shore, and it's just steps down a private path to the beach. The full kitchen, washer/dryer and bikes/beach equipment make it easy to settle in and hard to leave. Excellent location, comfortable bed and lots of chickens! Cottage had everything we needed to be comfortable and was just a short walk to the beach. Nice little North Shore cottage! This small little cottage suited our needs very nicely! Close to everything the North Shore has to offer from a grocery store to Ted’s Bakery and variety of food trucks. Haleiwa town is a short drive, as well, where there’s all kinds of food options, as well. Having the beach right out the back gate was wonderful! We enjoyed watching the Volcom Pipe Pro, as well. Always fun to see these competitions. Loved having the W/D and lots of extra towels, as well...very well equipped. Mahalo! We had a great time on the North Shore, always nice to come back. Donna and Darrel were very helpful.